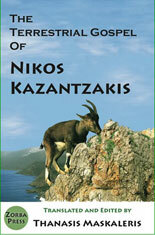 The Terrestrial Gospel of Nikos Kazantzakis is an anthology of passages selected from various books by Kazantzakis, centering on Nature. It is a powerful and poetic work that raises environmental awareness and calls upon us to engage in compassionate action. The book contains new translations from the Greek originals, as well as some poetry by Professor Maskaleris, a Preface by Jean-Michel Cousteau, and an essay on Kazantzakis, Crete and Biodiversity by Michael Tobias..
By Zorba Press, in collaboration with Dancing Star Foundation; and an original Greek edition by N. Kazantzakis Publications of Athens, Greece.